The last days of August have seen interesting, albeit tactical-level, diplomatic manoeuvres within the context of Russia and its relations with the West. The first steps in this late summer dance were literally taken by President Vladimir Putin and Austrian Foreign Minister Karin Kneissl at her wedding in southern Austria. Putin accepted an invitation to attend the wedding, as he was scheduled to meet with Chancellor Angela Merkel in Berlin later that same day, Aug. 18. This two-stage dance was designed to send a message and to create some measure of momentum in bridging the ongoing differences between Russia and the West. Shortly thereafter, U.S. National Security Advisor John Bolton shuttled to Geneva to meet with his Russian counterpart, Nikolai Patrushev, to engage in a similar dialogue on Aug. 23. Bolton then flew to Kyiv to meet with President Petro Poroshenko and to attend Ukrainian Independence Day celebrations on Aug. 24. It is useful to take stock of these engagements and to analyze their possible implications for the status of the current divide between Russia and the West, particularly as they may affect the simmering conflict in eastern Ukraine. The opening step of these events, Putin’s attendance at Kneissl’s wedding, drew significant criticism among the Western press, Austrian opposition critics and Ukrainian authorities. The gist of this criticism was that Austria, currently holding the presidency of the European Union, was departing from the EU’s policy of holding Russia to account for its role in the conflict in Ukraine and the seizure of Crimea. In addition, Austria’s tradition of neutrality, which its parliament formally adopted in 1955 following the withdrawal of the Four Power occupation forces and the establishment of the postwar Austrian Republic, was also not being adhered to. The avalanche of criticism directed at Kneissl and Chancellor Sebastian Kurz, who was also at the wedding, may have overlooked an important and interesting aspect of Austria’s diplomatic tradition in building bridges between East and West, thereby creating an atmosphere of confidence building for improving their relationship. In the heart of Vienna stands a large and impressive war memorial which the Soviets built in 1945 to honour the sacrifices of the Red Army as it fought its way across Central and Eastern Europe to the final battle in Berlin. The Austrians have maintained this monument from 1955, when the Four Powers’ occupation of Austria ended, to the present day. In the Cold War era, it stood as a symbol of neutral Austria’s role as bridge builder between East and West. Vienna became a hub of activity to manage Cold War tensions and to provide a venue for arms control and confidence-building measures. Today in Schwarzenbergplatz, Russian tourists proudly gather to take their pictures in front of the memorial. Austria continues to play a valuable diplomatic role as tensions between the West and post-Soviet Russia have emerged once more, most dramatically evidenced by the conflict in Ukraine. Diplomats from Europe, Canada and the United States meet routinely in Vienna under the auspices of the Organization for Security and Co-operation in Europe (OSCE) to oversee the modalities of the 2015 Minsk process for eventual peace in Ukraine. Putin’s invitation to attend Kneissl’s wedding may therefore be regarded as another Austrian diplomatic step to improve the negotiating atmosphere as Putin made his way to meet with Merkel in Berlin. Germany’s invitation to Putin for a bilateral meeting with Merkel was yet another measure of confidence building in an attempt to improve the negotiating atmosphere. Significantly, this was the first time Putin was invited to Germany for a bilateral meeting since the start of the Ukraine crisis in 2014. There was no expectation for a breakthrough in settling disputes. Rather, it was to emphasize that resolution should be sought through diplomacy and not war. At the forefront of the Berlin bilateral meeting was the topic of the Nord Stream 2 gas pipeline, planned to run from Russia under the Baltic Sea directly to Germany, thereby bypassing Ukraine and the Baltic states. Germany was therefore keen to ensure that Ukrainian interests would nevertheless be respected in the bigger picture, including the current pipeline access that runs through Ukraine. Specific discussion on Ukraine focused on tactical steps to disengage Ukrainian and rebel forces from the line of demarcation in the Donbass. German Foreign Minister Heiko Maas said: “We want to create a new momentum in the Minsk (peace) process.” He stated that sanctions relief for Russia would only be negotiated if the Minsk accord is implemented. Maas also spoke withUkrainian Foreign Minister Pavlo Klimkin in a similar vein. The next step in terms of Russo-German diplomacy will be Russian Foreign Minister Sergey Lavrov’s visit to Berlin, planned for Sept. 14. The Bolton-Patrushev meeting in Geneva focused in part on the future of the New START Treaty which is due to expire in 2021. The Geneva meeting was a follow-up to the Trump-Putin Helsinki meeting in July. 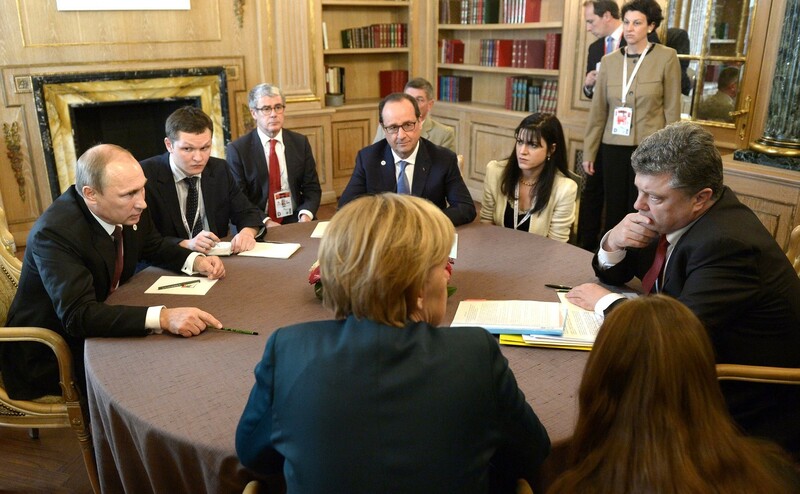 The resolution of the Ukraine conflict was discussed but no details of these discussions were made public. The closing act in August to this series of diplomatic steps was Poroshenko’s direction to the Ukrainian Foreign Ministry to prepare the paperwork to annul the Treaty on Friendship, Cooperation and Partnership between Ukraine and Russia by October 2018. Signed in 1997, the treaty came into force in 1999 with a mechanism for automatic renewal every 10 years. Ukraine’s position is that the treaty is no longer valid in the context of current Russo-Ukrainian relations. No breakthrough is emerging from the stalemate of the simmering conflict in Ukraine at present. However, there is a growing consensus on what will likely not happen, i.e., resolution by war or Russian capitulation to a status quo ante due to the pressure of sanctions and domestic economic woes. It may now be fair to suggest that the ongoing dialogue will lead to an eventual peace agreement, and what is left to determine are the parameters such an agreement will take.